You know what the world needs? Another device that streams content to your TV. ZillionTV agrees and the startup company is looking to deliver content to your TV mostly supported by advertisements – think Hulu but not actually Hulu. The box and remote will cost $100 upfront and the service will be supported by ads. The company hopes to provide premium content as well based on selling ads. To be honest, ZillionTV doesn’t sound that much different than other media streamers besides those advertisements, but maybe, just maybe, ZillionTV will succeed where others like ZeeVee have struggled to bring the convenience of Internet video to the living room. We need to be clear that this is a startup company so while it sounds great and we wish them all the prancing unicorns in the world, content providers are notoriously a greedy and controlling bunch. The company claims to have already reached deals with content providers but we’re not holding our breaths that this will ever hit the market resembling the concept. If it does though, damn, we might have a revolution on our hands. SUNNYVALE, CA — (March 4, 2009) – The television landscape is drastically changing as new digital distribution platforms emerge that enable truly personalized television. These personalized television services must offer expansive popular entertainment content, the choice of personalized, targeted advertising and the potential of interactivity with the on-screen content itself – all within an easily accessible, intuitive and affordable offering. ZillionTV Corporation (www.zilliontv.tv) is answering these requirements with its personalized television platform and service, announced today. Through agreements with major Hollywood studios, TV networks and Visa Inc., the ZillionTV Service will offer an extensive array of entertainment content; targeted and addressable advertising opportunities; and, television commerce, enabling consumers to make convenient and secure purchases through their television. The ZillionTV™ Service, currently in its Beta phase, will offer instant, subscription-freeaccess to entertainment content from Hollywood studios and TV networks, tapping the libraries of Disney, 20th Century Fox Television, NBC Universal, Sony Pictures and Warner Bros. Digital Distribution. All content is offered on-demand and delivered directly to the television set via a common high-speed Internet connection. 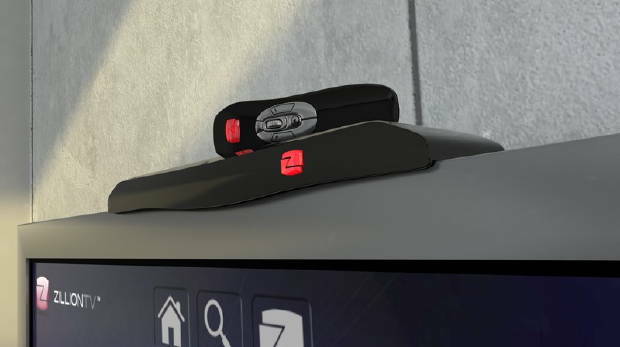 There is no costly hardware purchase required, as viewers only pay a nominal, one-time, initial service activation fee to receive the ZillionTV™ Device and innovative motion-sensing ZillionTV™ Remote control. Beyond the Company’s plans to ultimately deliver the most extensive on-demand entertainment library available in the U.S., with the expectation of having 15,000 titles on the Service by the end of 2009, the ZillionTV Service has multiple features that truly make it stand out from the crowd. • All of the ZillionTV Service programming is available instantly as it’s streamed to the television set – no downloading, progressive streaming or peer-to-peer networking necessary. Programming will range from select library content from 20th Century Fox Television to new releases and a selection of library titles from The Walt Disney Studios, NBC Universal, Sony Pictures and Warner Bros. Digital Distribution. • ZillionTV viewers choose how they want to watch programs – they can watch targeted and addressable ad-supported content for free, rent content for a nominal fee, or “buy to own,” depending upon what options are offered by each content owner tied to each specific program. For example, television content from NBC Universal will be available via “buy to own”. • ZillionTV viewers select advertising categories based on their interests and preferences � and, as a result, get ads that are more personally relevant when selecting to watch ad-supported content. • Viewers don’t need to follow a pre-set viewing schedule, plan ahead for later viewing, or worry about missing their favorite shows because ZillionTV programs are available on-demand, 24/7. • All programs are available through an intuitive, easy-to-use on-screen interface called the VUI™ Experience that features intelligent multi-dimensional search to help viewers instantly find shows or discover new programs by genre, actor, year, subject matter and more. Based on these choices, the system creates personalized recommendations specifically for each viewer. • Viewers will have interactive and t-commerce options, including the power to request information and purchase products directly from their television. • ZillionTV will offer a distinctive loyalty program, rewarding viewers for simply watching programming they love and interacting with advertising from categories they’ve personally selected. • Viewers the entertainment content they want, when they want it, streamed instantly for viewing on their television. • Content providers a new platform to give consumers access to their vast libraries of content. • Advertisers the opportunity to engage viewers directly with relevant and addressable TV advertising. Through the ZillionTV Service, content creators are afforded the ability to provide instant access to their portfolio of content through a cost-effective, quick and fully-customizable distribution platform. Without any content capacity constraints or limitations, ZillionTV enables content providers to offer a wide variety of movies and television shows, including content that might not otherwise be available such as libraries of timeless archived programming not accessible through traditional linear TV or other on-demand television distribution services. In addition, within the VUI Experience, every network, and even every show, retains its own identity within the interface itself. The VUI Experience eliminates the chore of paging through an on-screen guide and sifting through numeric channels, making it easier for viewers to find programs of interest. Finally, within the ZillionTV Service, content creators can opt to tailor their programming by geography, demographics and psychographics. This more targeted content delivery capacity helps the content community to more precisely gauge an audience’s reaction and get real-time feedback on programming, thereby gaining deeper insight into actual household viewing patterns. Gone are the days of mass market, untargeted television commercials. With the introduction of the ZillionTV Service, viewers choose advertising categories based on their personal preferences, and these preferences will direct which ads are delivered. Through the ZillionTV Service, advertisers clearly will reach a more highly-targeted and engaged audience. This is a major boon for the advertising industry. It will allow advertisers to leverage addressable and interactive TV advertising to create a more direct relationship with receptive target consumers. The ZillionTV Service also allows advertisers to target audiences by geography, demographics, consumer preferences, and viewing behavior, resulting in guaranteed engagement, better brand alignment and more comprehensive audience response reporting. In addition, through the ZillionTV Service, advertisers are no longer confined by 30-, 60- or 90-second television spots – a 30-second commercial is just as welcome as a three-minute, episodic video. Instead, advertisers gain extensive flexibility and creative freedom to develop new methods for connecting with viewers. And with the right TV commercial in place, advertisers only pay for ads that are actually viewed, resulting in greater efficiency and virtually no waste of their media spend dollars. Advertising campaign business models such as cost-per-click, cost-per-action and revenue-sharing, already in practice on the Web, will become available to ZillionTV advertisers on the television. In addition, from the onset ZillionTV offers tangible metrics that link media spends to actual results, and link commercial viewing to purchase data – making calculating a TV campaign’s return-on-investment easier than ever. ZillionTV and Visa Inc. have worked together to offer viewers a secure and convenient way to make purchases. By linking their Visa card with the ZillionTV™ Service, viewers will have the power to purchase products directly from their TV by using the patented ZillionTV™ Buy Now Button on the motion-sensing ZillionTV™ Remote control. Visa cardholders will also benefit from enhanced offerings such as targeted promotions. As the ZillionTV Service simply requires a common high-speed Internet connection to gain access to instantly streamed entertainment directly to the TV, ZillionTV is currently exploring strategic partnerships with major Internet Service Providers (ISPs) of all types. The ZillionTV Service offers ISPs a significant value-add to their current mix of consumer offerings and enhances the attractiveness of their premium high-speed services. ZillionTV is conducting field trials in multiple markets nationwide and will continue a market-to-market roll-out strategy throughout 2009.